This topic contains 1,583 replies, has 64 voices, and was last updated by Darkest Star Games 5 hours, 6 minutes ago. For the first time in over 20 years I am trying something that is not 6mm?!! 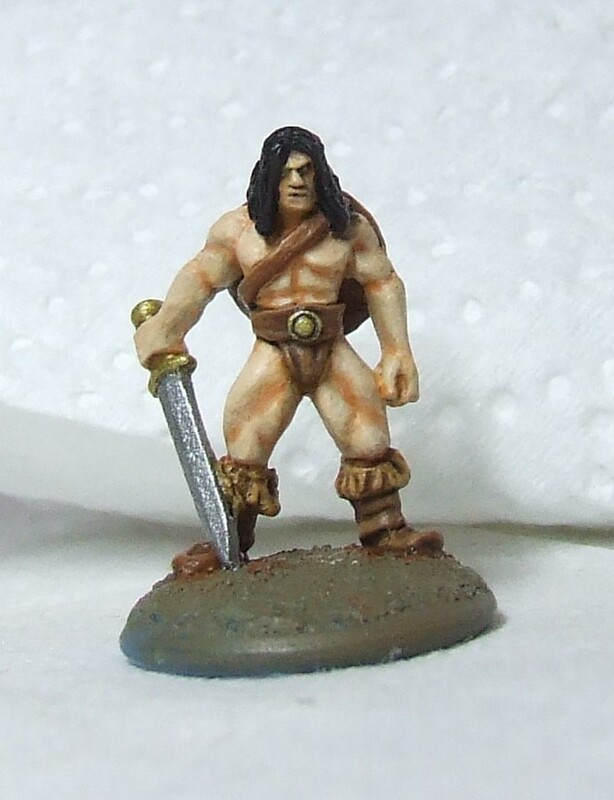 I am going to have a bash at some 15mm Conan flavoured fantasy skirmish using the CROM rules. 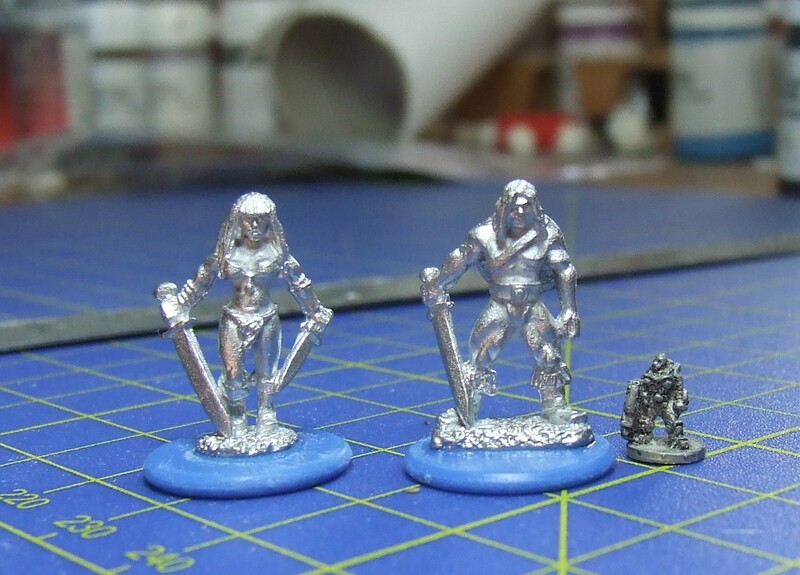 I have purchased some Copplestone Castings 15mm barbarians and I have selected my model, and Samantha has selected hers. Croms teeth these are a bit bigger than what I am used to, how can I possibly paint them?? 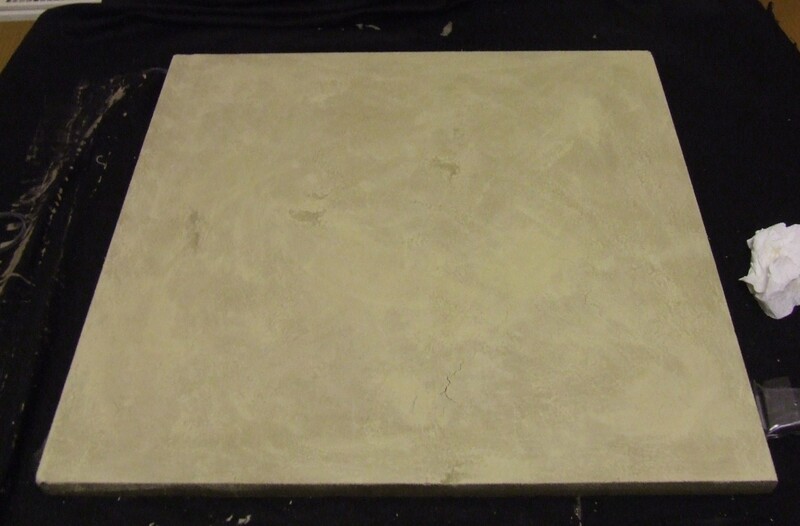 I have started work on the board, a humble 2′ x 2′ TSS tile that I am covering in sand and then will paint up. 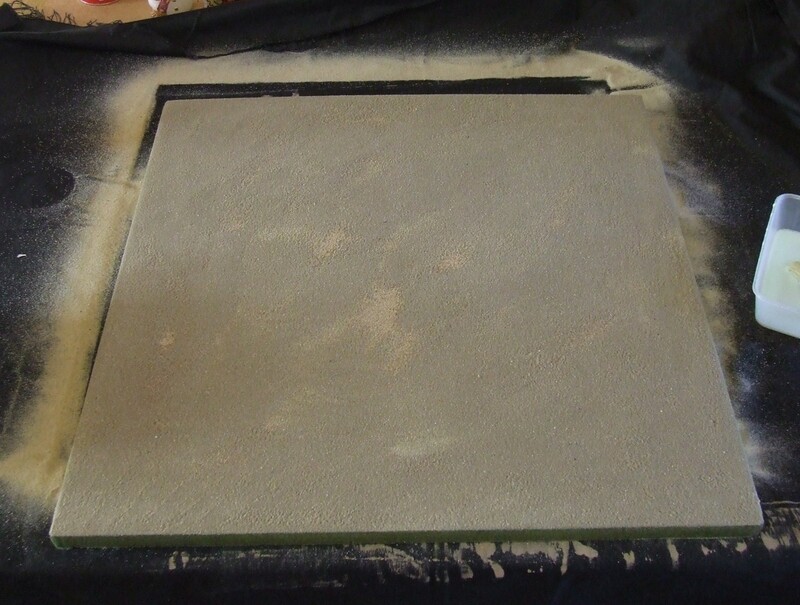 Here it is with some pva/water/washing up liquid slapped all over it with some sand sprinkled on it and the excess shaken off. He asked me if I was going to paint my own miniature. 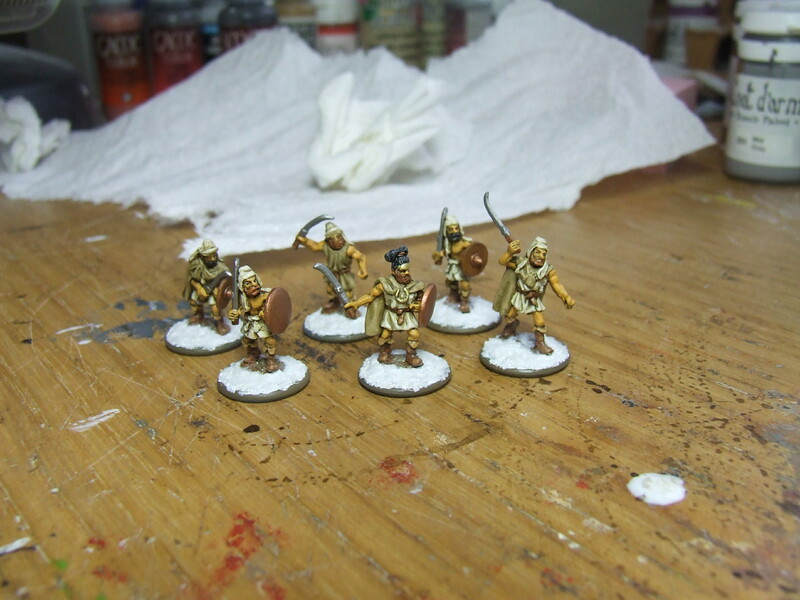 I have the painting skills of a chimp…. and that is probably unfair to chimps. Never put a sock in a toaster. Looks like an interesting set of rules. I’m surprised !!! 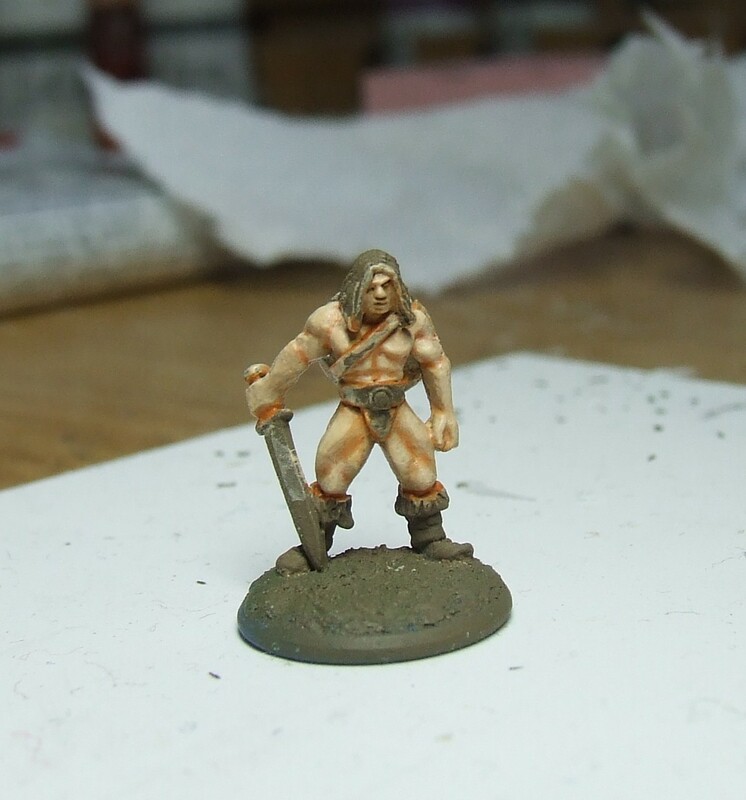 15 mm you say and By CROM !!!! I’m truly excited to see result ! Is it just me, or is that RDF infantryman looking enviously up at those big, shiny barbarians? LOOK AT THE SIZE OF THOSE THINGS!!! RUUUUUUNNN!!!! Anyway, good luck with this project. Speaking as a huge fantasy fan and a scale-polygamist I wholeheartedly approve. Sounds like a fun project. 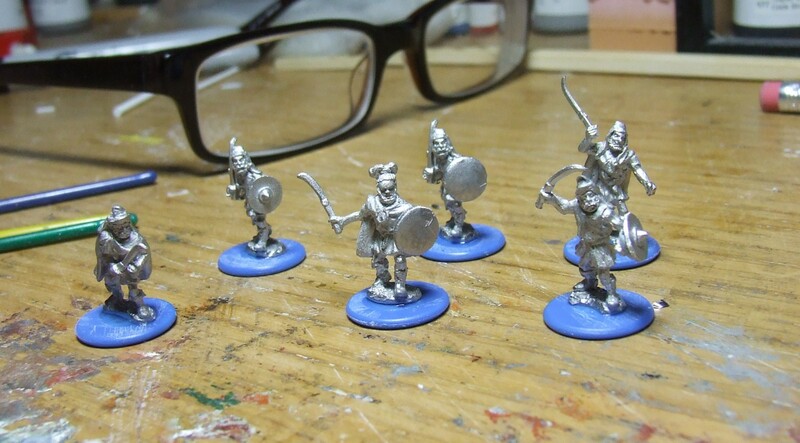 I love those Copplestone barbarians (I wish he would hurry up and add a few more figures to the range). I’m also a sucker for anything Conan so I look forward to hearing how this turns out. Has he stated that he will? I’d be very happy if this was the case (and I have no idea, myself), but expanding his ranges on a continuing basis is not really his usual style. This reply was modified 2 years, 3 months ago by Rhoderic. He has, but that was somewhere around february/march this year and no word or movement since. He said there would be Romans and more Picts , but the first releases would be a pack of Ice Tribe Warriors (like GoTs Wildlings) and an Ice Giant. I even subscribed to the northstar newsletter hoping for some more intel but nothing so far. He has, but that was somewhere around february/march this year and no word or movement since. He said there would be Romans and more Picts , but the first releases would be a pack of Ice Tribe Warriors (like GoTs Wildlings) and an Ice Giant. Oh that’s right, the bit about the Romans rings a bell, now you’ve said it. So, the plan such as it is. 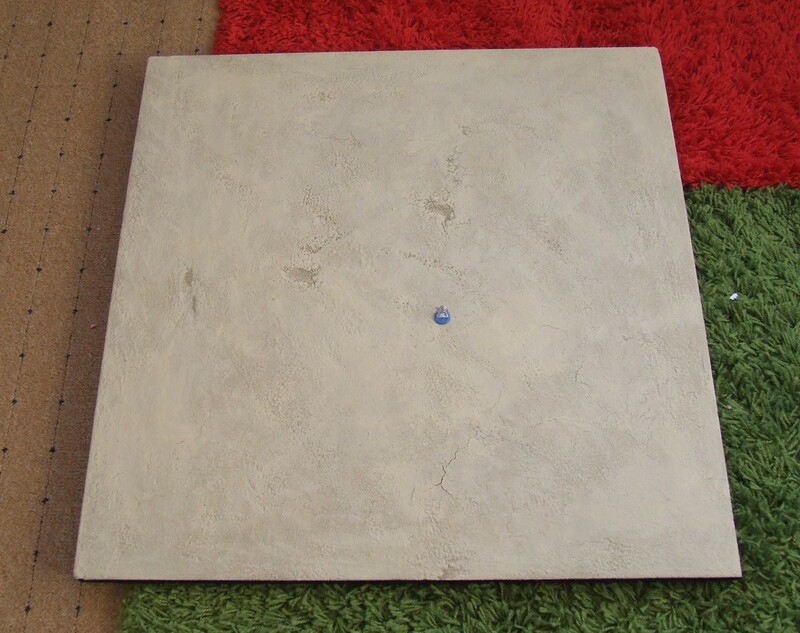 Play some games in a dry sort of African style desert setting rather than pictish grey stone and green. I have bought a web domain so that is sitting there waiting for me to make some stuff to sell on it. Now, it will start off very slow as this is all new and different and it will take some time to get used to. I think my first few items will happen as it did with AB, I will need something for a game, so I will make it and cast it up. So to ease me in gently I will make an adventurers camp site, nothing fancy, some tents, a fire and maybe a few rolls of cloth/bags. Then I plan on doing some hut type things, but as noted, NOT the typical grey stone thatch roof type. 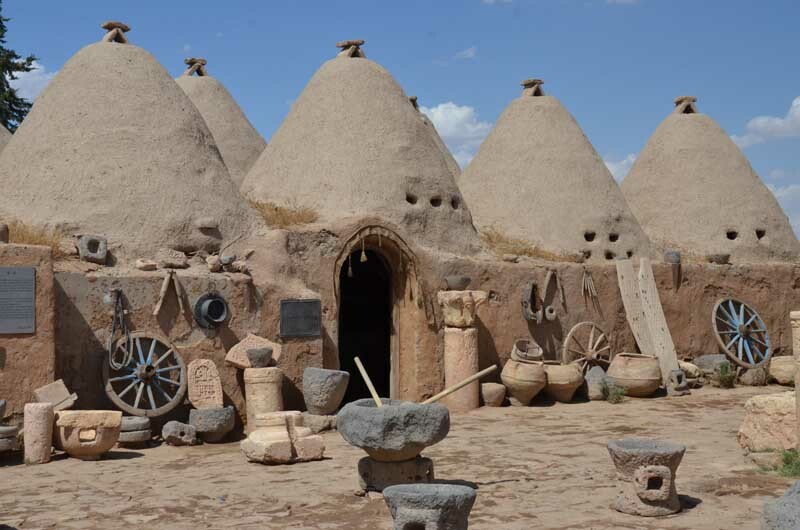 Some type of timbuktu, kingdom of Mali inspired buildings could be cool. Something in the style of the Djenna mosque perhaps. Those are perfect for shady dealings, hiding out in and beating information out of informants but once that is done you’re going to need a stronghold to loot. Modular mudbrick walls and gates to make a compound would be good too, perhaps with a watchtower or two. Offhand I can’t think of anything like that in 15mm (& precious little in 28mm). Slapped some paint then PVA then paint on the board, quick and easy dry dry board. Just the edges to do to finish it off, then some terrain and then some figures and..
Blimey, I had forgotten how much effort went into starting a new thing. Board is done, black edges cos you know, contrast. To be fair, the light does make the board seem a bit washed out, it is not quite that pale/monotone. Start painting up some figures next. Talking of figures, I was looking at these and thought I recognized one of the names of the painters, so I checked my FB and he is indeed a ‘friend’. So I pinged him a message to see if he thinks they were comparable in size to the Copplestone Barbarians, and I was hoping for maybe a photo or two. However he came to my house and gave me a box full of various 15mm figures for free!! Thanks heaps to Jon and his gaming club. Look forward to seeing how your figures turn out. I am intimidated a bit by the size to be honest. Also decided that we will create new characters rather than use the famous ones. Not even sure anything will be true to the official world. Just barbarians in the desert doing heroics. They picked the wrong 2 naked people to rob! Getting quite excited now and making fighty noises as I push them about. Looks good. So, do the figures scale well with each other as you had hoped? 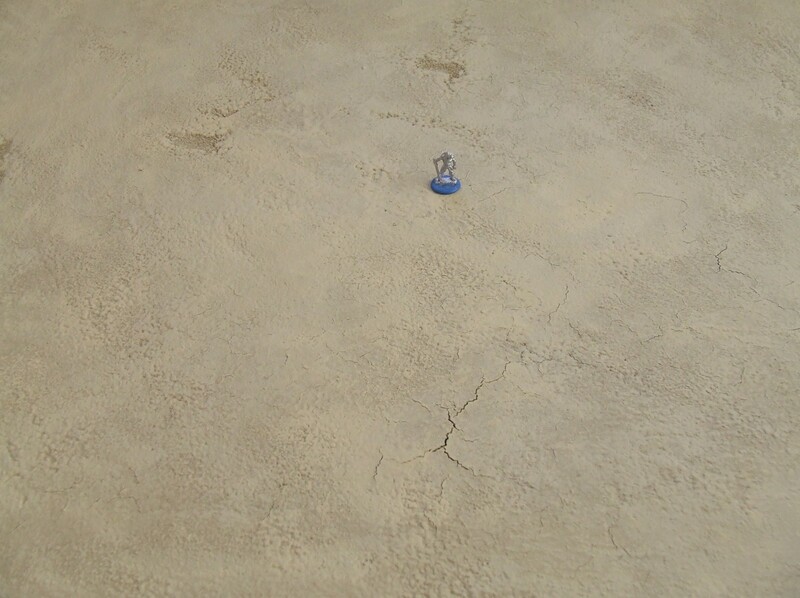 I think possibly the Copplestone are teeny bit bigger, but to be fair, that is a good thing I think. Looking forward to seeing them painted up. What do you use to bulk up the bases? Those are brave men knocking at our door. Let's go kill them! I actually had some green stuff left over for the heroes, so most of theirs was that. 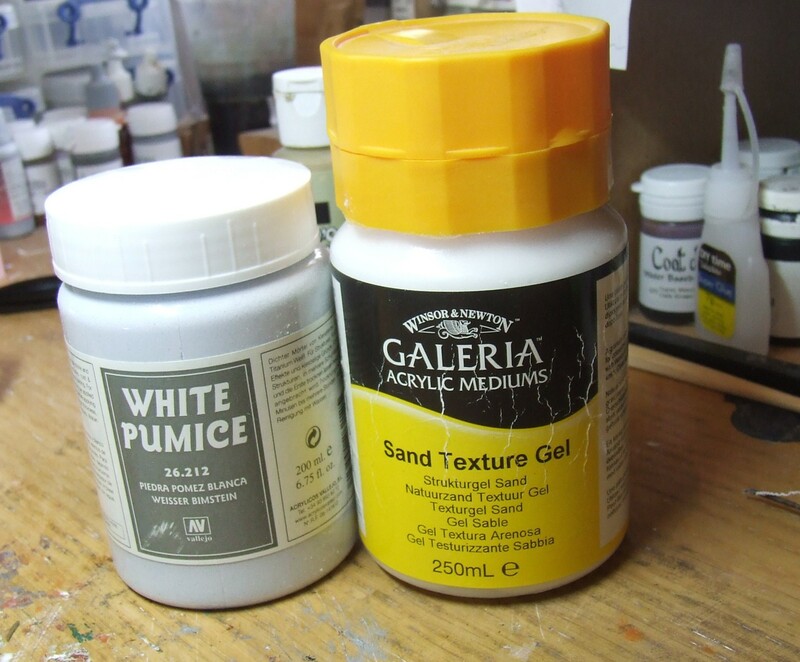 The white pumice is coarser and grainier, whereas the Gel is less so (though still not smooth). If you have seen my Anshan build, the mud area there is the gel. Just brush it on then wash the brush and hey presto, wait to dry. Did Fan-Tastic just become a thing…? ha ha, maybe for 2018! It is interesting, for me at least to see how easier it is to paint bigger figures. I was totally worried about the blending issue, as on 6mm the biggest area of blending is really really small and then only about 3 shades, so it is hard to see any crap blending. This however is lots of flesh and about 8 shades. Whilst it will never win any painting competitions (messed up his right thigh a bit and a few other bits) it has turned out not too bad and it was very quick to do, by do I mean do so far, still clearly a WIP. 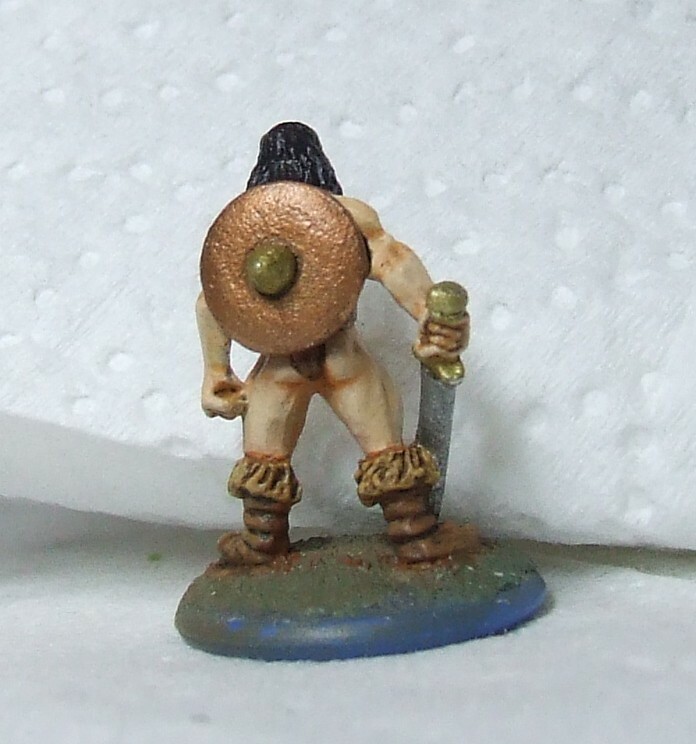 Here is my unnamed hero so far, I am quite pleased for my first not 6mm figure in years. 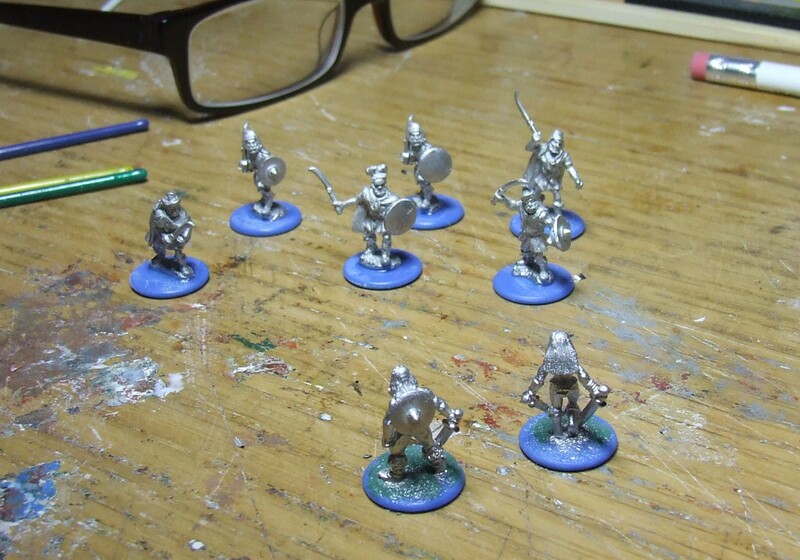 I have concluded (whilst painting the bandits) that in order to get more than 3 games in this year, I will paint the bad guys to a so-so standard, rather than trying my best. This will speed up the whole process and allow some actual gaming. I have a positive feeling that this year may involve some actual game playing! Fantastic job. That Copplestone range is amazing. Yeah, the lure of the hero is great, that and I am not painting the goons to my best so not sure there would be much honing. Whilst searching through the horde of stuff that Jon gave me I found this. 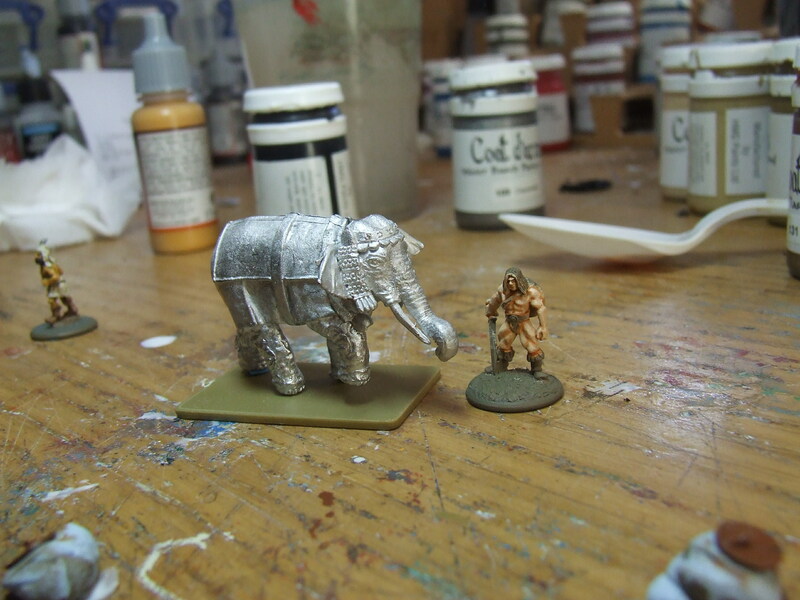 I see Conan’s camel and raise him an elephant! Cool! Don’t see nearly enough elephants in fantasy imo. ah-ha some crudely painted bad guys! Just waiting on the bases to dry before finishing them off. AB, are you priming these with white? 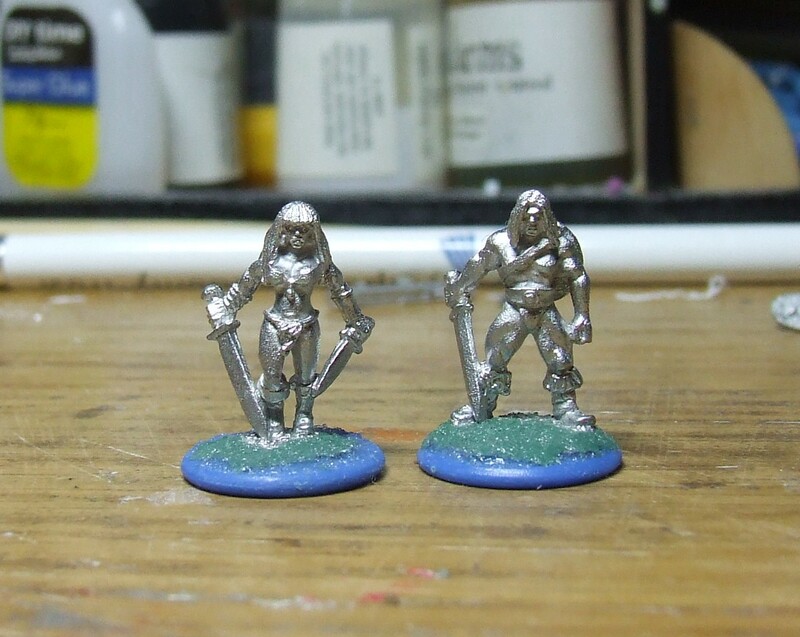 I know that black primer is pretty popular with 15mm painters, but my own experience was that it often led to figures that I thought were too dark– especially figures that are shirtless or otherwise show a lot of bare skin. Brown, I never use white, or black for that matter. The hero looks more washed out than he is, cos of my bad lighting. That’s interesting. I’ve experimented with brown primer in the past, but I never stuck with it. Maybe it’s time to revisit it. Humbrol No 29 Dark Brown spray paint. 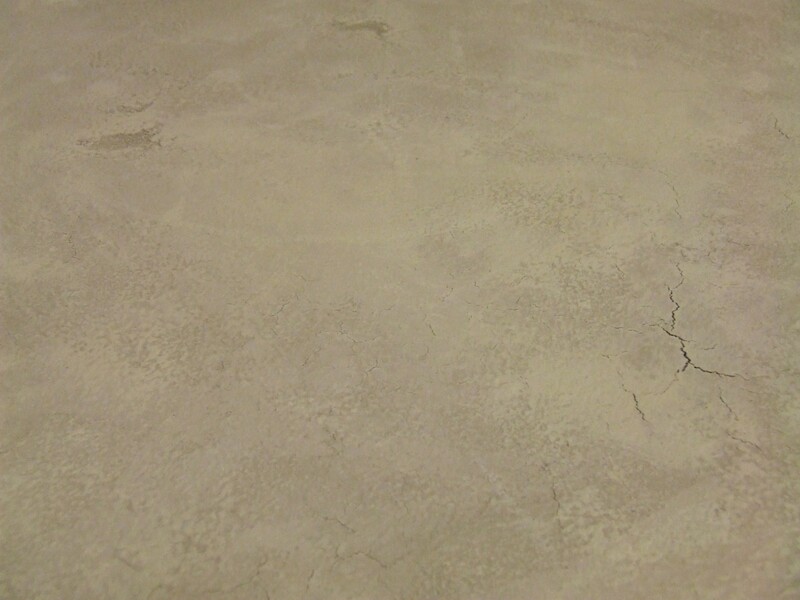 I find it gives a nice thin coat (unlike car primer which many seem to use) and offers a nice middle ground base.